ABUKAI Blog: So easy a puppy can do your expense reports! So easy a puppy can do your expense reports! If you were wondering whether ABUKAI Expenses "IS" the quickest and easiest way to do your expense report, just go to YouTube and watch Mia the Puppy! At 9 months she already has learned how to create expense reports by just taking pictures of your receipts using ABUKAI Expenses. 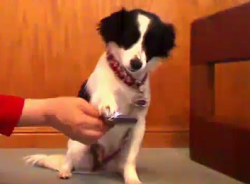 She can't think of any other application out there that comes close to making it possible this little puppy her to help her owner submit expense reports. And filling in report forms with a pen, or typing into an expense management system interface just didn''t work...even with her small paws. So if Mia can complete expense reports this easily, just think how effortless it will be for you!